Most people don’t like to use the word “diet” in the same sentence as the word “Disney” but I’m going to anyway… let me explain. 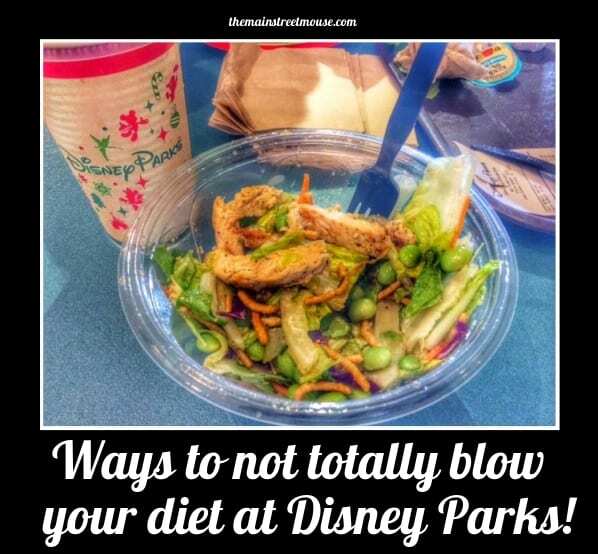 When I was visiting Disney Parks yearly for vacations, all bets were off when it came to eating healthy. I would eat as much junk food and such as I wanted to, and truthfully, that was fun. Being that I’m a local now, and visit the parks more often, I can’t eat like that anymore. Special occasions, yes, but not on the regular. Also, it’s a new year, and a lot of people have vowed to lose some weight in 2016, it’s the most popular resolution out there! So, is it possible to visit a place like a Disney Park, and still behave when it comes to food? Sure there is! It’s not always easy, but it’s do-able! I know there are many diets out there that people try, so everyone is different in what they’re looking to accomplish. Me, I’m on the high protein/low carb plan. That’s a HARD one to do at Disney, I won’t lie! However, I’m always looking for ways to stay on track and still enjoy my visit at the same time. There aren’t a ton of salad options at WDW, but there ARE some. The ABC Commissary at Hollywood Studios has a great Asian Salad with Chicken (featured in the picture above). That one is probably my favorite walk up salad across the board. Other places with decent salad are Pecos Bills and Cosmic Rays at the Magic Kingdom, Pizzafari at Animal Kingdom, and The Electric Umbrella at Epcot. At Downtown Disney, Earl of Sandwich has AWESOME salads, like the BBQ Chicken salad and the Thai Chicken salad. I’ve never had a bad salad at Earl of Sandwich. The hard part is not getting one of their amazing sandwiches, or one of their yummy good brownies. Will power…. sigh. It takes so much. As for getting drinks, of course Disney serves Diet Coke and Light Minute Main Lemonade. You can also get free ice water at the walk ups at the parks. Now, sometimes the ice water has a mineral taste to it, but there’s a way to fix that. I sometimes keep packets of lemon juice in my purse, and add that to the cup of water to make it taste better. Also, you can keep packets of Splenda or some type of artificial sweetener with you and add that to the lemon water as well to make your own calorie free lemonade. Just an easy little trick that doesn’t cost you anything extra! Disney allows you to bring in your own snacks to the parks, and I try to remember to pack an extra snack or two when we’re going to be gone all day. I usually bring packs of almonds or a protein bar to help get me by between meals. A lot of walk up snack places throughout the parks carry healthy options as well, like veggies and dip and different fruits. Don’t forget, the ice cream stands have sugar free fruit bars too. Sure, it’s not as good as a Mickey Premium Bar, but at least you get to have a treat when others in your group get one. Another way to cut calories is to order a kids meal at a walk up instead of ordering the full size option. Every little bit helps when you cut back, and the CM’s don’t mind if you order a kids meal, we never had a problem. If you don’t want a kids meal, or a salad, Cosmic Ray’s has a grilled chicken sandwich that you can get with green beans instead of fries, and it’s actually pretty good! I did that on the night of the Christmas Party because I knew they were serving free cookies and hot chocolate, so I wanted to be good with dinner! It’s the little things!